“Psst! 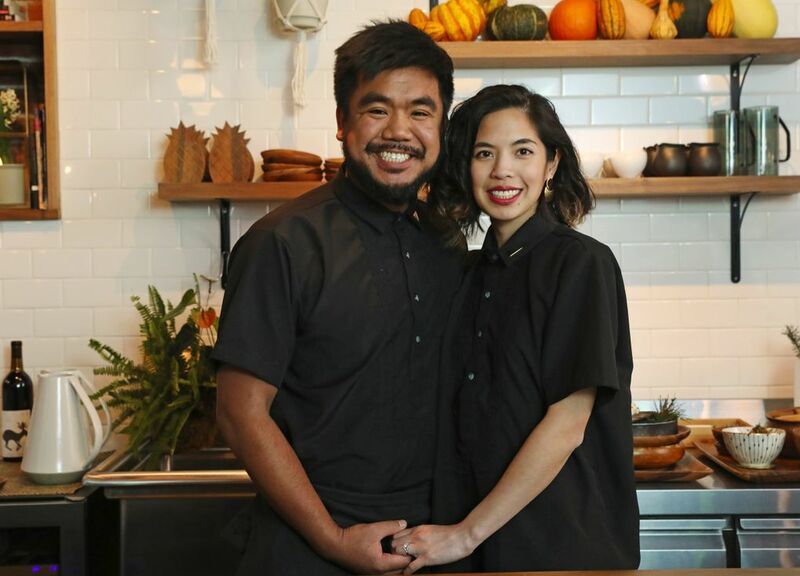 Hoy!” That’s how you get a Filipino’s attention, chef Aaron Verzosa tells the eight rapt diners gathered around the counter at Archipelago, the Philippine-inspired restaurant Verzosa and his wife, Amber Manuguid, opened Dec. 1 in Hillman City. Psst! Hoy, Seattle! Archipelago deserves your attention. Eight people is the max they can seat at the broad counter bracketing the white-tiled kitchen where Verzosa and Manuguid work in tandem. 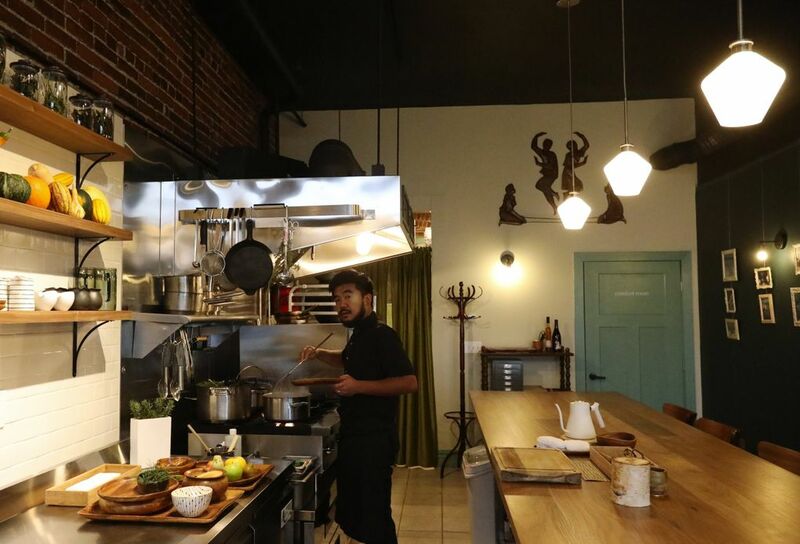 Filipino food frames the narrative; Pacific Northwest ingredients flesh it out. 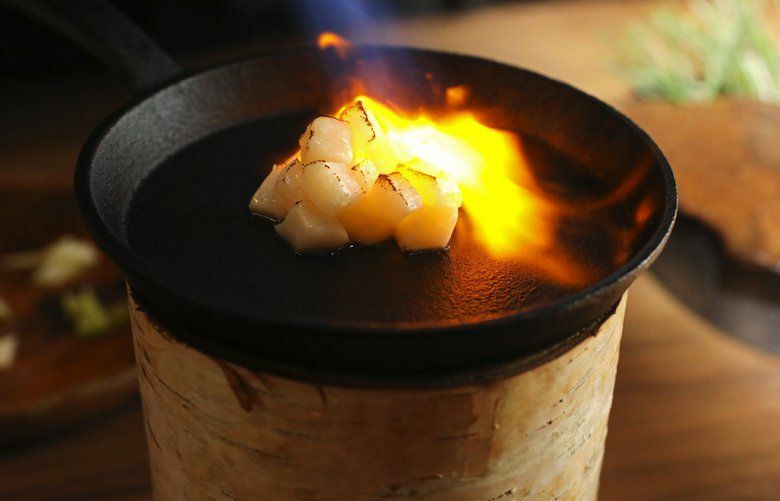 An evening at Archipelago is both entertaining and enlightening, as much a cultural odyssey as a culinary adventure, though to be sure, at $126 per person, including tax and tip but not beverages, it’s no cheap ticket. (And you do purchase a ticket, prepaid and nonrefundable, though transferable, through the Tock reservation system). Save up. The evening is worth it. Dinner starts with pandesal, a still-warm, slightly sweet, palm-size roll with toasted crumbs clinging to its burnished crown. In Manila, you might dunk that into coffee or hot chocolate for breakfast. At Archipelago, you dab each bite with salmon butter, or shallot butter topped with Idaho sturgeon caviar. If you’ve elected to get wine pairings, they might pour Montinore Estate Vivacé, an Oregon sparkler, or a bubbly from Washington’s Treveri Cellars. The bread, butter and wine are the opening chapter in a story of cultural integration told through the talents of these second-generation Filipino Americans. 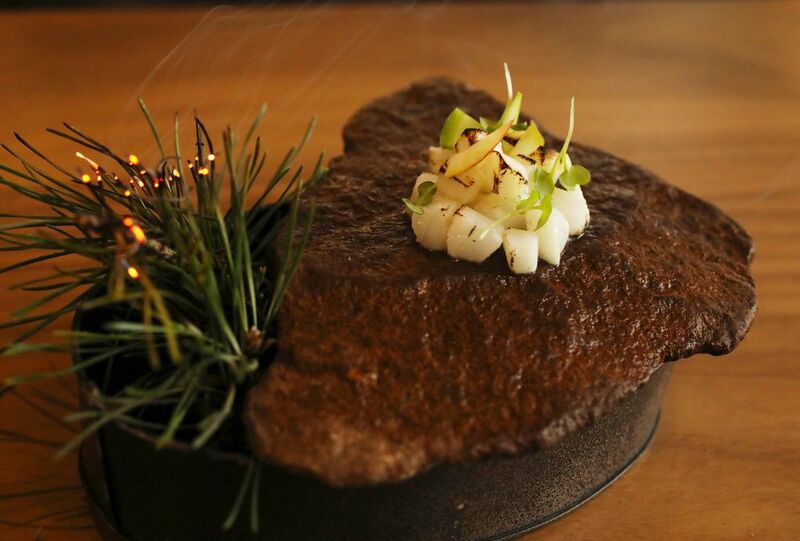 The 10-course meal that unfurls over two hours is rooted as much in the food traditions of their heritage as it is in the haute cuisine techniques Verzosa honed while doing research and development with Nathan Myrvohld’s “Modernist Cuisine” team. By swapping out tropical ingredients for those indigenous to the Pacific Northwest, he’s not trying to mimic Filipino food so much as move the conversation forward. For Kinilaw, a ceviche-like dish typically made with an oily fish denatured by vinegar, Verzosa cures rich king salmon and marinates it in verjus, green juice pressed from Washington grapes. He tucks in bits of apple and scents the dish with a scorched fir sprig tucked beneath a river rock. The whole construction balances on an empty sardine tin, symbolizing the cannery jobs that brought many Filipino immigrants to our state early in the past century. Sinigang is a Filipino soup or stew characterized by a sour broth usually made with tamarind. We don’t have tamarind trees here, but we do have cranberries that deliver a similar tartness to a broth mellowed with alliums and garlic. Cranberry sinigang bathed king salmon one night; another it pooled around Puyallup-raised pork. The shoulder, belly and baby back ribs have been cured with salt and porcini powder and steamed at a very low temperature for 24 hours, rendering the pale meat unimaginably tender. “Anak ni Bet” plays off Pinak Bet — mixed vegetables steamed in bagoong, a sauce made from fermented fish. Verzosa achieves something similar using fermented cabbage and caramelized vegetables — leafy greens and creamy squash grown in Wapato by Filipino farmers there for generations. One of the best stories they tell is that of Maria Orosa, a Filipino food scientist and war hero educated at the University of Washington. During WWII, she developed a soy-based powder that nourished Filipino and American prisoners in Japanese concentration camps, and a shortage of tomatoes led her to invent the enduring condiment banana ketchup. Verzosa’s tribute to banana ketchup is a sweet pumpkin puree amped with Oregon chilies, a sauce that worked as well with ling cod and winter greens as it did with dry-aged rib-eye. Slender, hand-cut miki noodles arrive midway through the meal. 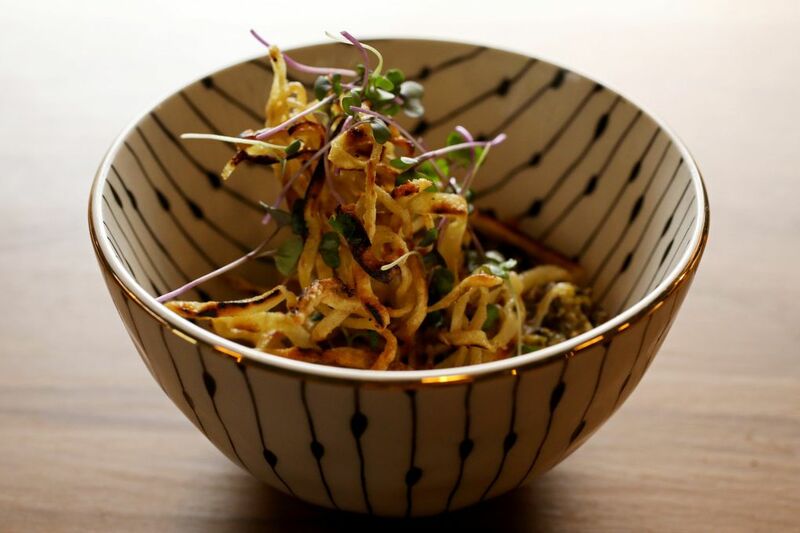 Unlike the better-known pancit, which are rice noodles, miki are made from wheat, in this case Nash’s Red Wheat, and house-milled rye berries. Lightly skillet-crisped, they might be tossed with Dungeness crab and bacon marmalade, or with bacon-longanisa sarciado, a thick emulsion sparked with Orosa sauce. Either way, the miki made a rousing first-act curtain. The final curtain came down after a palate-reviving “fruit salad” featuring pear in various chilled iterations, and a honey-sweetened bowl of grains that falls somewhere between granola and porridge. The mix of cornmeal, hazelnuts and toasted triticale (a wheat and rye hybrid) is a crunchy Northwest nod to the chocolate rice pudding Champarado. Verzosa and Manuguid were both born in Washington state — a day apart as it happens — and met as students at the UW. Verzosa pursued culinary arts after graduation, attending Seattle Culinary Academy, cooking at The Harvest Vine, and staging in Paris with Michelin-starred modernist chef David Toutaine. Manuguid, an artist, became a “designer of experiences,” which she does for Nordstrom by day, and in the evenings at Archipelago. The couple execute a calm choreography as they prep, cook, plate and serve. As good hosts do, they stimulate conversation with snippets of food and family lore. Every serving piece has a story. Petrified rocks are deployed as butter dishes. The delicate gold-rimmed cups and saucers holding cabbage-bolstered beef broth came from Manuguid’s mother’s china cabinet. The albizia wood plates were made in Pampanga, the province Manuguid’s dad hails from. Service is formal but relaxed, and thoughtful. Manuguid promptly whisks away the pandesal crumbs, sets out fresh utensils for each course and offers warm, wet towels to wipe fingers greasy with pork ribs. They send you off with a printed menu and a pasalubong — Tagalog for something you bring back as a souvenir. The small box held mamón, a sugar-dusted chiffon sponge cupcake. Every baker has their version. Verzosa’s pays tribute to his dad, Sonny. Consider springing for the $50 wine pairing. The outside-of-the-ordinary choices favor small, biodynamic wineries and cideries and are smartly matched to the food. At times, though, beverages were out of sync. Ideally, you want the drink to arrive ahead of its intended mate. There is no bottle list, but it’s possible to order a single glass of any of the evening’s selections. House-made juice pairings are a $40 option for those who prefer zero-proof libations. It’s wise to preorder the juice pairing. They are made fresh in limited quantities from seasonal, locally grown fruits and vegetables. Count on not leaving hungry. Their parents, the owners say, would never forgive them. Thus, they play a game called “Tailor Made” with the final savory course, asking diners to choose a number from one to five indicating how full they are. Five means “stop right now.” One means “enough with the small plates and tweezer food.” People choose every number in between, even half numbers. Verzosa dishes up accordingly. In his mother’s house, he says, everyone would be a one.